Many of us Ecommerce website owners use Google Product Listing to list our products and gain additional traffic. Unfortunately that’s all changing when Google rolls out it’s new “Google Commerce” plan. 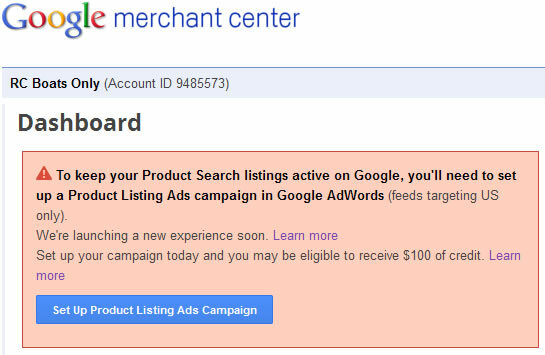 Google Commerce will force anyone with their products on Google into paying per click for their products. According to Google they say that, “We believe that having a commercial relationship with merchants will encourage them to keep their product information fresh and up to date.” I understand a lot of users have had trouble keeping their products up to date, because I’ve been one of those users. I run an rc boat website but just don’t have the time to tend to the updates. It’s just hard to update your Google shopping feed every 7 days for most of us, so it’s surprising they haven’t come up with a better solution. I know there are ways to automate the feed upload, but it seems you need to still monitor it and make adjustments to get it working properly. I highly doubt feed freshness is not the only reason why Google is changing to the new feed though. Of course, they are trying to bring in more revenue and go with the flow of the other search engines, which is quite funny considering they are the leader and now they are mimicking Yahoo and Bing’s shopping results. Some are arguing that Google is changing their image from the old plain search results to bulky obtrusiveness and I think I may agree. Have you seen the way Yahoo and Bing’s products look? It looks nice but it turns the search engine into an Ecommerce shopping cart! Well, I guess we’ll have to see how it works out because we have no choice. The simple days of Google are over my friends. Which one is the most obtrusive to you? Will you pay to keep your products in Google’s Commerce Feed?